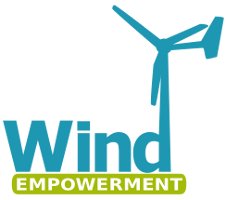 The stator is the very important electrical part of the wind turbine. 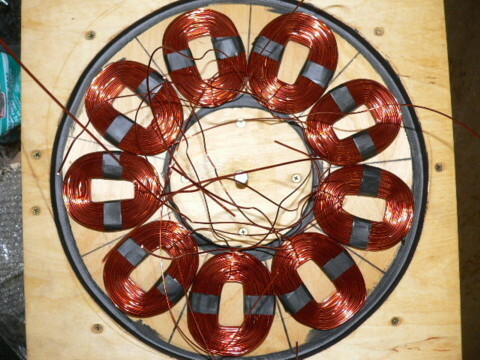 It contains all the coils of wire which will have voltage induced in them as the magnets pass over them. It's defined as the 'stator' because it is the 'stationary' (it doesn't turn) part of the alternator. 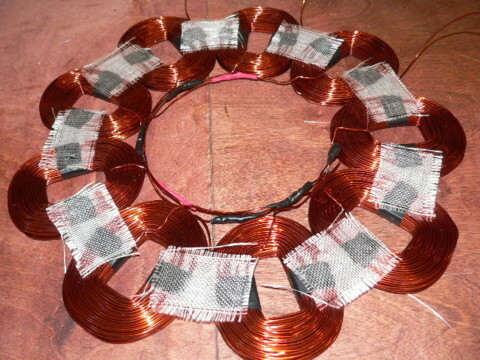 For this project you're building a 3 phase alternator and the stator will have 9 coils. Each phase will consist of 3 coils in series and you'll make a star connection between the phases. You'll build this in our stator mold and the lines on the bottom of the stator mold will help to know the the coils are the correct size, and that they're placed correctly. 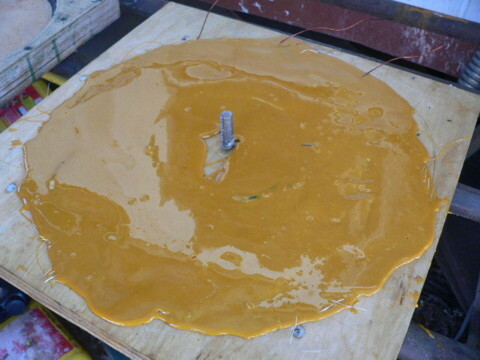 - Thin viscosity Cyanocrylate glue (super glue) with accelerator. 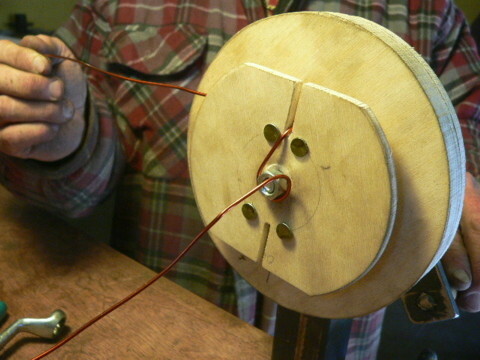 Pictured above Scott's winding with two strands of wire. This is necessary for 12 Volt machines. 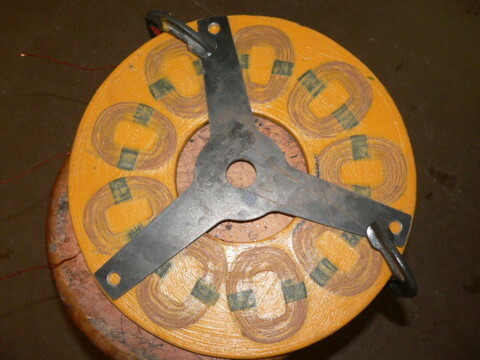 - For 12 Volt machines you need to wind with two strands of #14 gage wire in hand and each coil should have 36 turns. 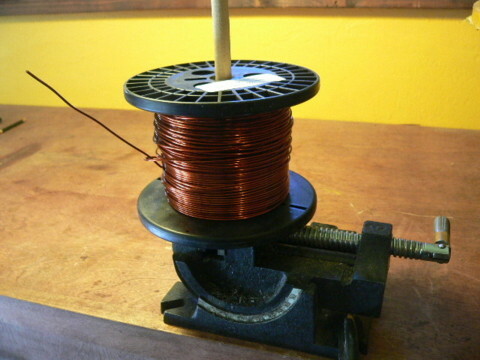 - For 24 Volt machines wind with 1 strand of #14 gage wire and each coil should have 70 turns. 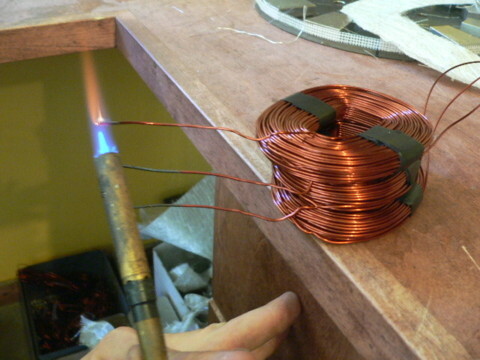 - For 48 Volt machines wind with 1 strand of #17 gage wire and each coil should have 140 turns. 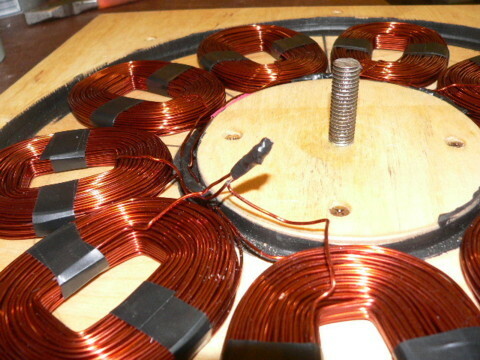 If you follow the guidelines above, and the coil winder is made according to the plan then the coils should fit nicely in their alloted space, and the whole stator should require about 6 pounds of wire. If the rest of the alternator is assembled properly then the machine should start charging batteries at about 140 rpm which is nice for a 10' diameter blade. 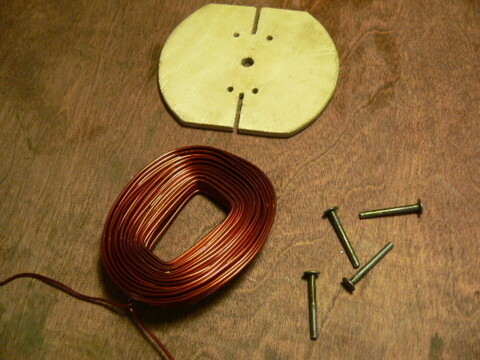 Start by creating some kind of fixture to hold the spool of magnet wire. 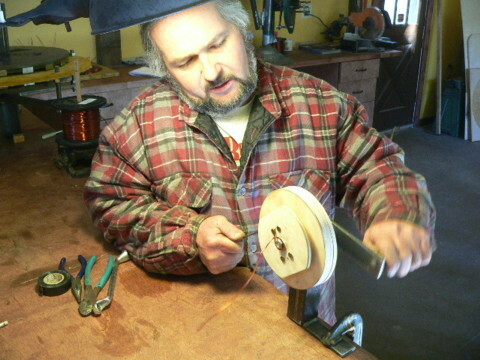 I usually use a vice with a piece of threaded rod, or a wooden dowel sticking up to put the spool. Clamp it to the work bench securely. 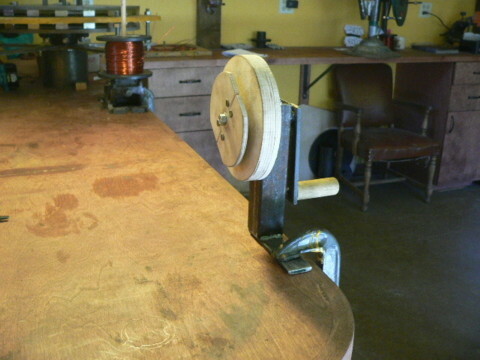 Clamp the coil winder to the workbench with a C clamp as shown in the picture. You'll need a pair of side cutters (to cut the wire), a pair of needle nosed pliers (to bend the wire) and some electrical tape. 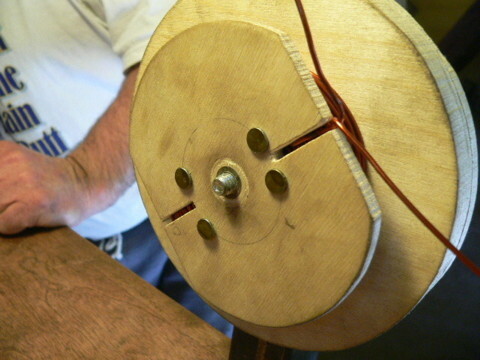 If the coil winder has a wing nut holding it together then you can use your fingers to take it apart. Otherwise you'll need a 1/2 wrench. When you bolt the front on the coil winder finger tight is fine, but after all the wire is wound on the spool the nut will be tight so - if you dont have a wing nut, you'll need a wrench to get it apart. About 10" from the end of the wire bend it sharply 90 deg with the needle nosed pliers. Drop the wire in the slot of the coil winder and bend the end around the nut. (A wing nut helps here too..) This will hold the wire from slipping when you wind the coil. Hold the wire tightly in one hand (keep tension on it) while turning the crank with the other hand. 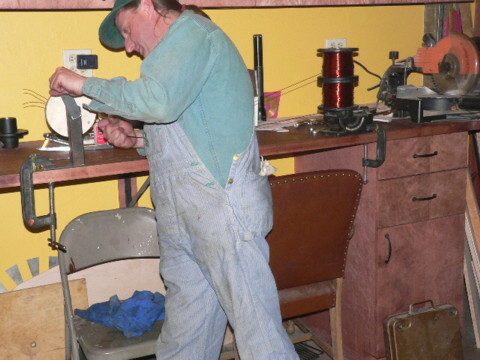 Be careful to keep constant tension on the wire and try to turn the coil winder at a constant speed. I notice lots of folks tend to turn it faster on the down stroke and slower on the upstroke - this will usually result in a lop-sided coil (one side of the coil wider than the other). It's important to keep constant speed and consistant tension. Try to wind the wire in neatly but don't obsess over perfection. I've seen some folks take over an hour to wind a coil trying to pile the wire in perfectly. 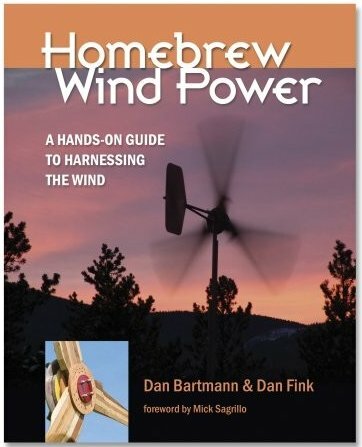 It should take no more than a minute or two to wind a coil. Once you've got the correct number of turns, pull the lead out of the slot and twist the two ends together (1/2 twist - just enough to hold them together). Don't twist more than you need because later you'll undo this and it's nice not to bend up the wire more than necessary. Grab the wire between the spool and the coil with one hand, and clip it so that there's about 10" of wire out of the coil. (both leads coming from the coil should be about 10" long) Take the loose end that's coming from the spool, put it on the workbench and set something on it (the side cutters are handy since they're probably still in your hand) so that the wire on the spool doesn't unravel. Take the end of the coil winder. The coil will come with it. The coil should pretty much fall off the end if you just turn it over. Do it carefully so the coil doesn't fall apart. We refer the longest sides of the coil as the 'legs'. Tape the legs of the coils with a couple wraps of electrical tape to hold things together. One coil is finished. 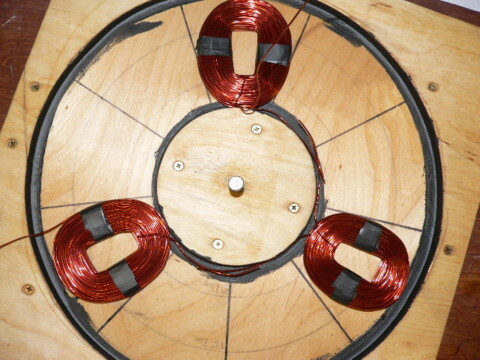 Check your coils, they should fit in the stator mold as shown in the picture. 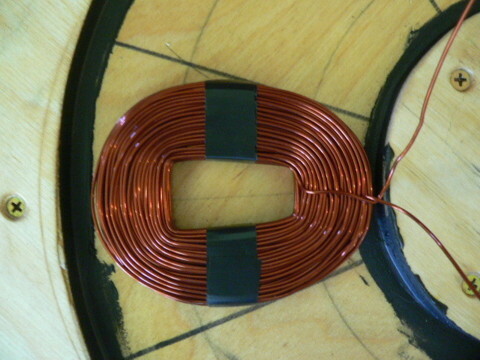 It's OK if they're a bit smaller we used #16 gage wire in the coil pictured. If you use #17 wire as called for, they'll be a bit smaller. 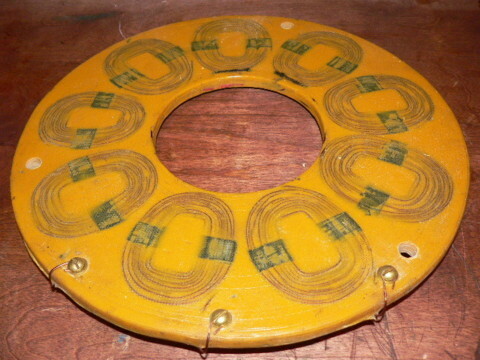 Remember the stator mold has 9 radial lines that tell us the maximum width of the coil, and it has two circles (8" and 12" diameter) that show us the path of the magnets. 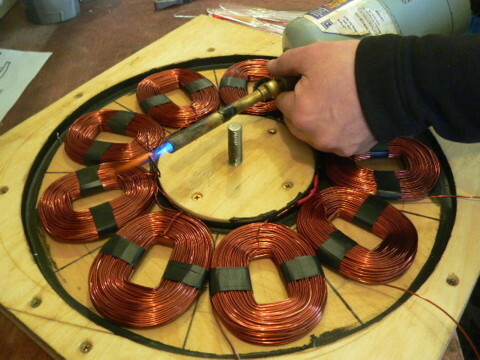 When checking the size of the coil center the hole in the coils center over the 8" and 12" circles. In that position the coil must fit in between two of the radial lines. If the first coil fits well, then wind 8 more like it. In the picture we've put all 9 finished coils in the mold, you can see how they're almost a perfect fit. Again - you might have them come out slightly smaller than those pictured which is fine. The drawing shows how we'll wire the coils together. Each phase is numbered and consists of 3 coils in series. We define each coil (and each phase) to have a 'start' and an 'end'. 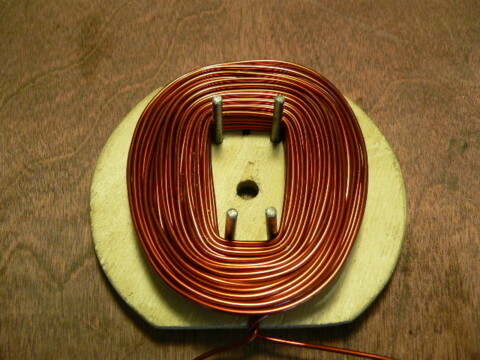 The 'start' is the lead that comes from the inside of a coil, and the 'end' is the from the outside of a coil. The only thing not shown in the drawing is the 'star' connection. (In the drawing the starts are labelled A, B, and C, the ends are labelled X,Y, and Z) To make the star connection you'll connect the 3 starts (A, B, and C). 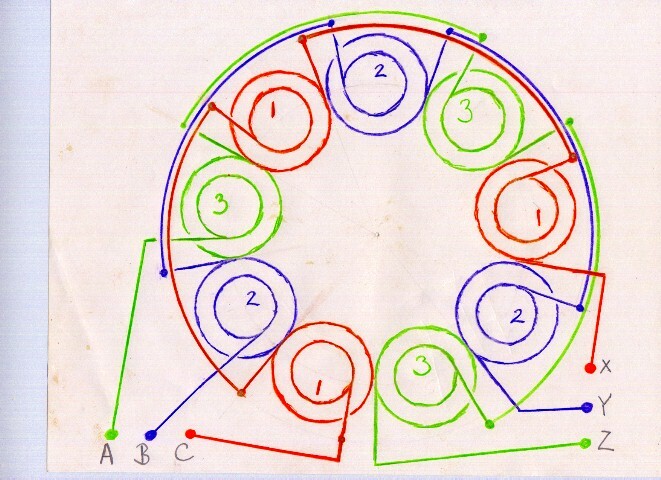 The only difference between the drawing and what you're going to do is that you'll make all the connections on the inside diameter of the stator. Take 3 coils and put them in the mold in their proper position. Pick 3 spaces which are 120 deg apart. 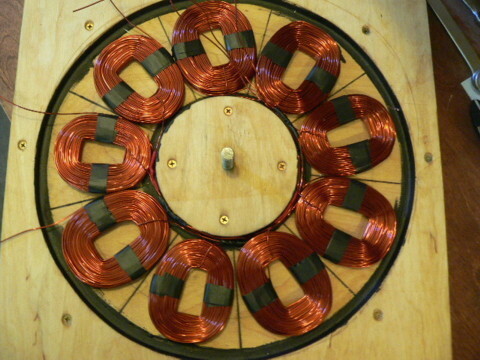 If you coud superimpose and image of our magnet rotors over these three coils you'd see that they are seeing an 'identical' magnetic situation, therefor they are 'in phase' with one another. (when one of them is at maximum voltage so will the other two be). Be sure all 3 coils are same side up (the start of the coil is the wire that crosses over the inside, and it should be facing up - you need to be sure that no coils are 'upside down'. We are about to wire up 1 phase of the alternator. Take the 'end' of one coil, and wrap it around so that it points towards the outside of the mold - and tape it to the leg of the coil. (Basicly you're adding 1/2 of a turn to the coil when you do this). It used to point towards the inside of the mold, now it should point to the outside. Then take the inside of of the same coil and bend it around the island in the middle of the mold to the next radial line in the mold, and cut it off about 1/2" past that line. 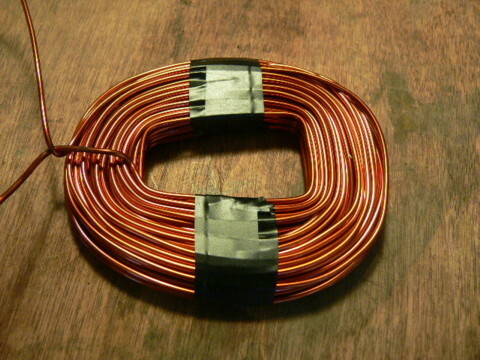 This wire will connect to the end of the next coil, and the start of that coil will need to connect to the end of the last coil in that phase. So what your doing is making sure you have just the right amount of wire to connect the coils and cutting off the excess. It's better to be a bit on the long side than a bit on the short side so give yourself a little extra length to be sure - but not much because there's not much room for wire on the inside of the mold. Once this is done to three coils you have 1 phase ready. Repeat this for the next two phases. The insulation on good quality magnet wire is fairly thick and very hard to scrape off. I find that it's usually double insulated and the inside layer of insulation is almost invisible, so even though you might think you've done a good job of stripping the wire - it can be decieving! The best way is to burn the insulation with a propane torch, about 1" back from the end of the wire. I usually heat it enough so that the wire itself becomes red hot. 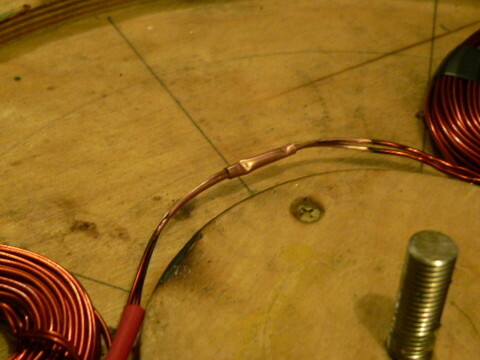 This also anneals the copper and makes it easier to twist together. Do this to all the leads that you've cut. You've not cut the end of the 1st coil yet (it sticks out towards the outside of the mold) and you've not cut the inside of the last coil yet so leave those be - you'll deal with those later. Let the wires cool down, and then clean the burned insulation off carefully with sand paper. Put the 3 coils back in the mold and twist the wires together tightly. You can see in the picture how the connections are pretty much centered in between the coils. Then solder the connections, and bend them over with pliers so you can insulate them with electrical tape and keep it all as thin as possible. You can also use heat shrink here for neater appearance - if you do, be sure to put that on before you twist the leads together! 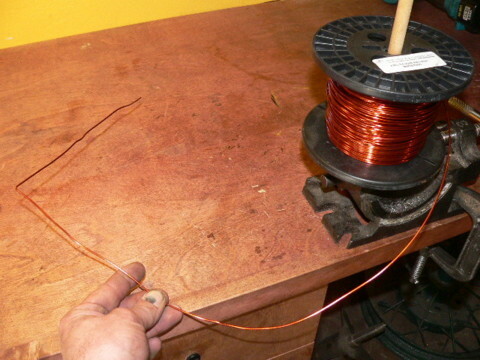 If you're building a 12 Volt machine with multiple strands of wire it can be tricky to twist things together nicely. 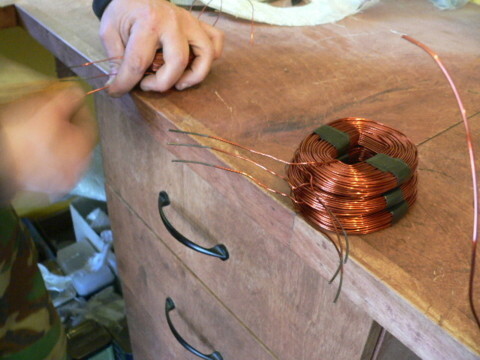 For machines that have multiple strands, it works well to make your connections by inserting the coil leads into small copper, or brass tubing - and then crimp and solder. Once you have one phase connected together, carefully remove it from the mold and do the same thing to the other two phases. Once all three phase are finished, put all three back into the mold as shown in the picture. 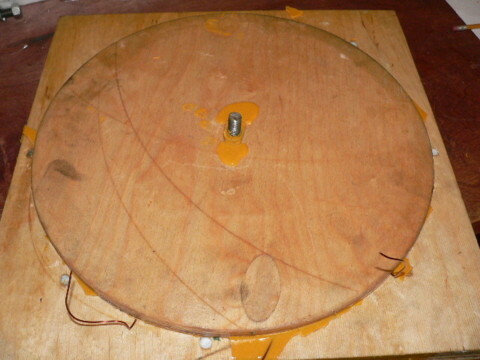 Do it such that your three 'ends' (those wires that are pointing towards the outside of the mold) are beside each other. 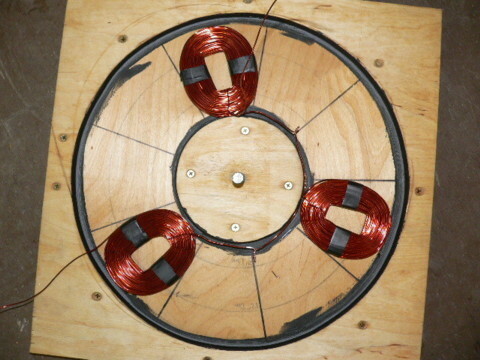 Those three 'ends' will be the leads out of the stator (the output from the wind turbine). Now you need to make the star connection between the phases. The 3 inside leads should be brought together so that we can connect them together. Leave enough slack in the wires so that we can make this connection, and then push it down between the coils and the island in the mold. 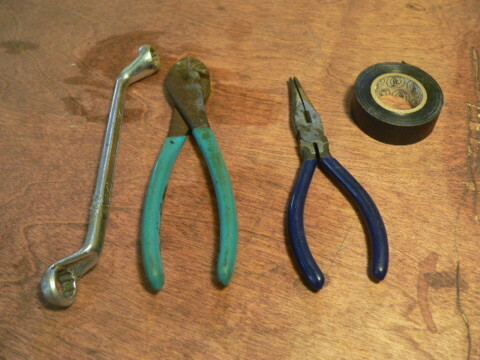 So figure the length, cut them off, burn the insulation with the torch, sand it, twist them and solder them. 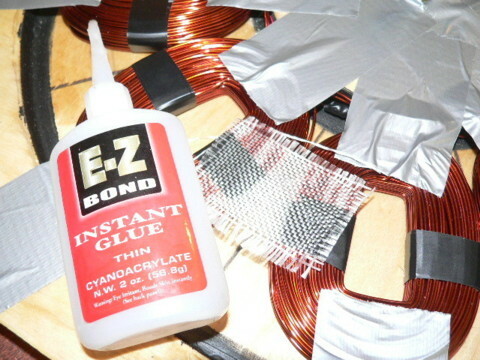 Then insulate the connection with electrical tape or heat shrink. Pictured above is the finished star connection, all that needs to be done is to poke it down so it doesn't stick up above the coils. Even though the coils fit well and are the right size, once we make all these connections things are kind of springy and surely the coils are not in their perfect place. The connections we made and all that wire around the inside is sure to push some of the coils out further than they ought to be. 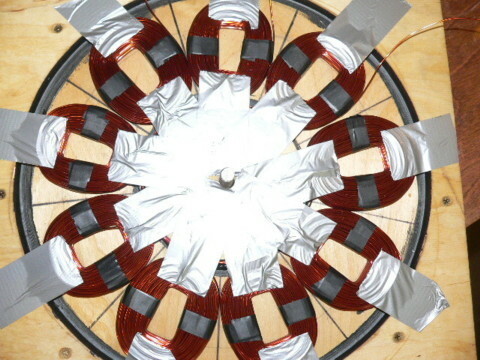 Use duct tape and go around the stator 1 coil at a time, and tape it exactly where it belongs. 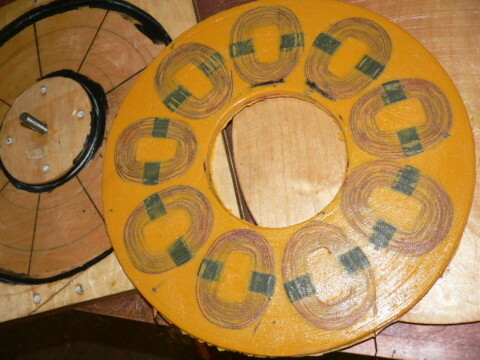 Keep the tape off the 'legs' of the coils as shown in the picture. Cut 9 little rectangles from fiberglass cloth about 1.5" wide and 2" long. 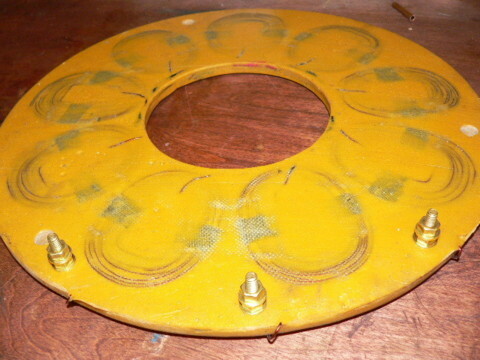 Before you cast the stator you'll need to remove the coils from the mold again. 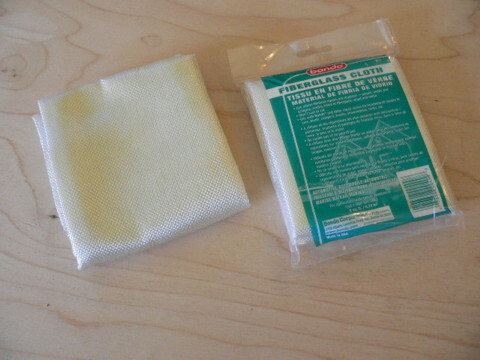 We'll use these squares of cloth and superglue to hold everything together so that we can move it. Use the cyanocrylate glue to glue the fabric rectangles to the legs of the coils. Put plenty in - you'll know its a good glue joint when the cloth becomes transparent. This will also serve to somewhat 'pot' the legs of the coils and prevent individual wires from vibrating against one another - maybe not an issue, but I like to have lots of superglue in the coils. 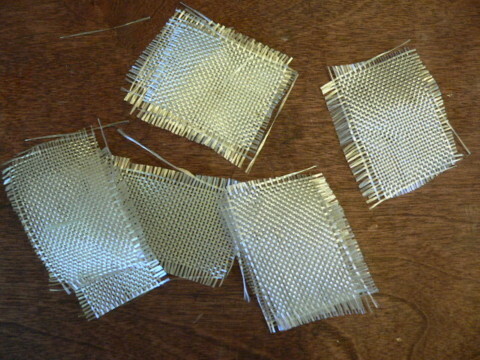 Also put glue on the fabric between the coils so that the fabric becomes 'hard' and less flexible. This will make the stator fairly rigid and easy to handle before you cast it. Try hard not to glue the coils to the mold! 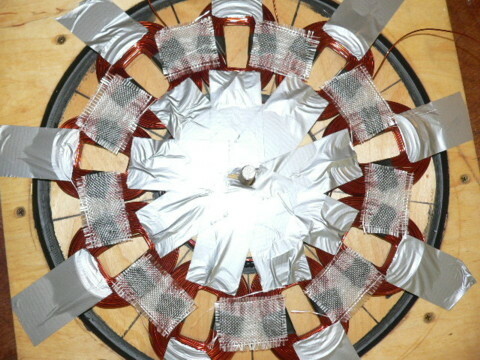 In the picture you can see all the coils are connected to one another with fiberglass cloth. Remove the duct tape, it should pull off easily. 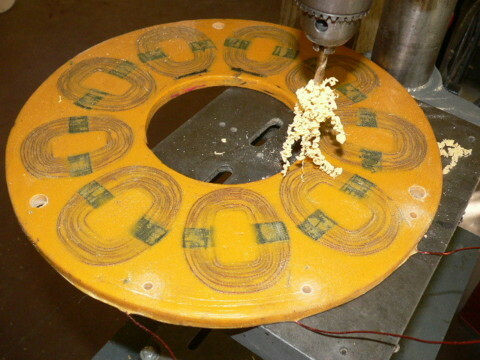 Now you can carefully pick up the uncast stator and remove it from the mold. Put it somewhere safe untill you're ready to cast the stator in resin. 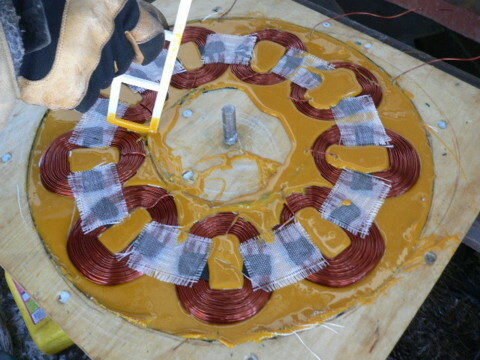 The stator will be cast in the same polyester resin you used for the magnet rotors. 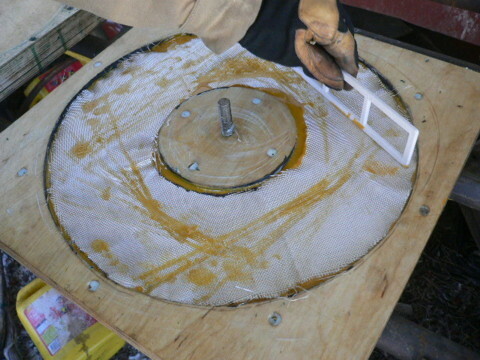 You'll need fiberglass cloth on both sides of the coils. 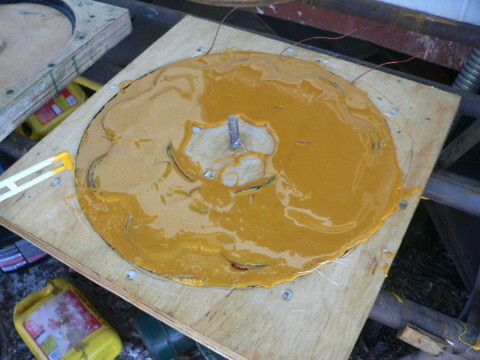 It might be useful to reveiw the section on casting magnet rotors before doing this as the proceedure is very similar and safety precautions are the same. 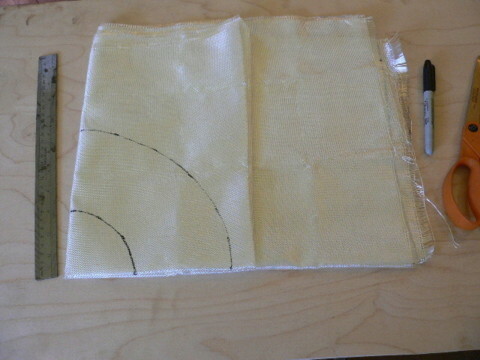 If you fold the fabric correctly, you can lay out just 1/4 of the ring and cut out two in one shot. You need two rings of fiberglass 15" outer diameter and 6" inner diameter. 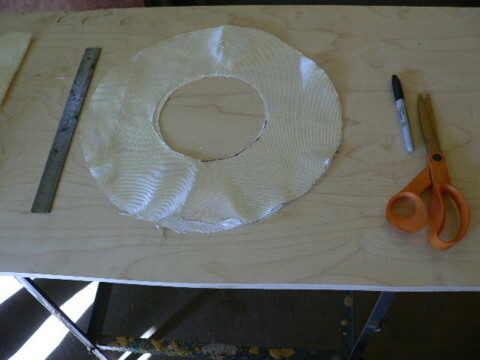 In the picture you can see the two rings of fiberglass. Set them, and the coils aside for now. Grease the stator mold inside, on top - and around the edge. Same with the lid - everything should be carefully covered with grease, or wax. Automotive or wood wax works really well. 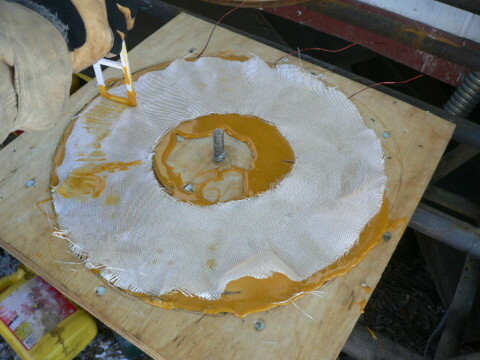 It takes about exactly 1/2 gallon of resin to cast the stator. Find a level place to put the mold. It's important to either keep the edges of the mold off the workbench - or find a work bench (like the one in the picture) that allows access for C clamps around the edges of the mold. 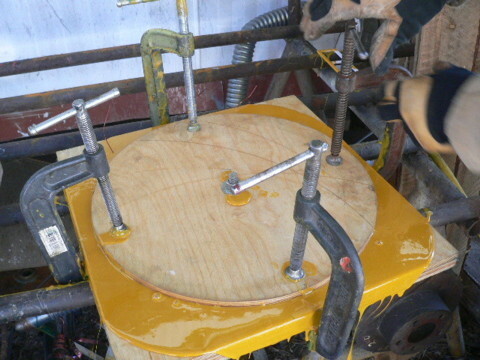 When your done you'll need to clamp the lid down with C clamps so think ahead! Pour about a pint of resin into the mold and roll the mold around so that the whole bottom and the sides become covered 'wet' with resin. Then pour about another pint of resin in the mold, work it into the fabric more - try to work out any airbubbles. Put the coils in carefully, poke at them so resin runs all around the coils and airbubbles come up. 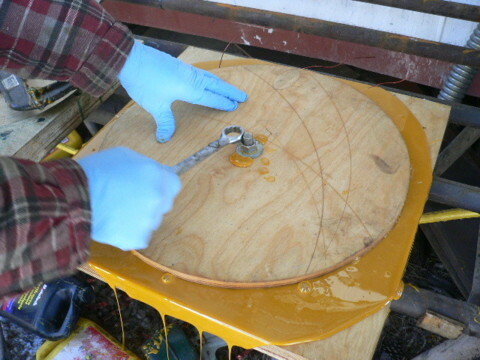 Then fill the mold with resin and be sure all surfaces of the coils have resin on them. 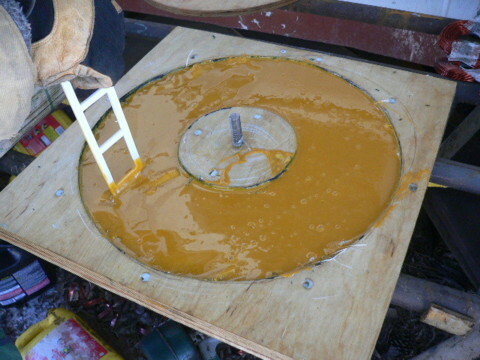 Put the remaining fiberglass ring over the top of the coils and work resin into it - again, it should almost disappear. Pour the remaining resin over the top of the fabric. Work it in and try to work out air bubbles. It might not hurt at this time to beat on the mold a bit or vibrate it with a sander (or something) for a couple minutes to help air bubbles rise to the top. Carefully put the lid of the mold down over the casting. Put a 1/2" washer over the threaded rod, and run the 1/2" nut down over it. Tighten the nut - this does a good job of clamping the lid tightly on the mold and assuring that the finished casting will be 1/2" thick. Put a C clamp on each side of the mold (use 4 C clamps) and tighten them evenly. You'll have some idea when the resin is hard by all the stuff that spilled out the side! 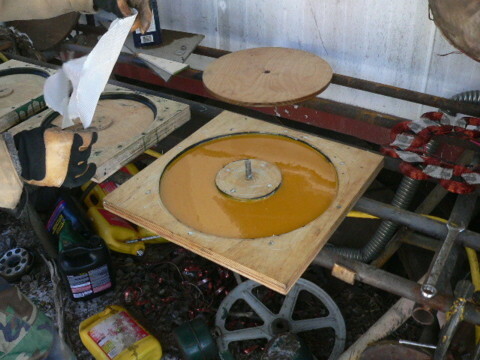 Let the stator sit in the mold untill the resin is hard. A chisel works well to scrape/peel the resin off around the outside of the mold. A good time to do this is while it's still a bit flexible (before it gets really hard). 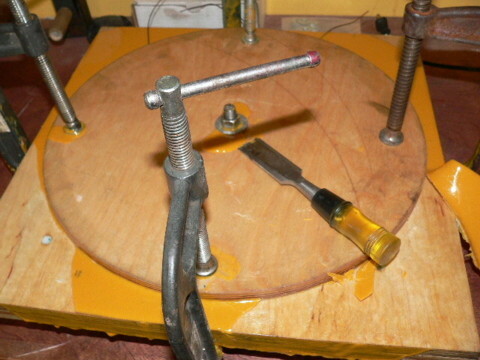 Once the resin seems hard then remove the C clamps and the nut in the center. Use a chisel or a screw driver to gently pry around the lid untill it breaks loose. Once the lid comes off you can usually turn the mold upside down and the stator will just fall out. 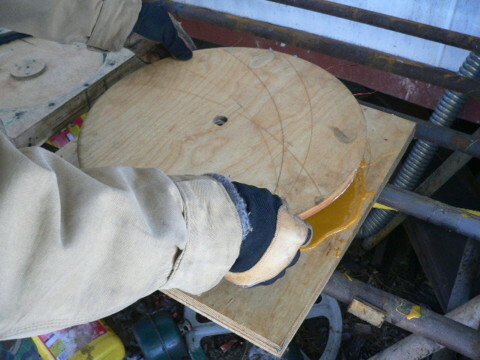 If not then turn the mold upside down and tap on it with a hammer or pry gently at the edge of the stator. It should come out easily. 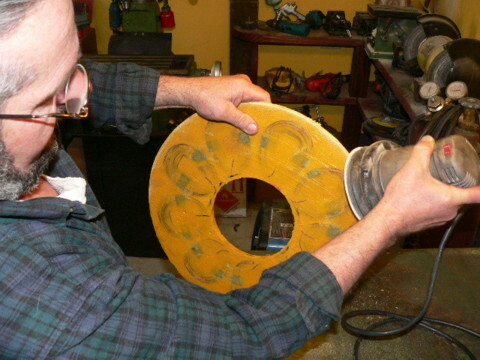 Use a file or a sander (or both) to clean up the edges of the stator. The inside diameter must be pretty clean because there's not a lot of extra room between this hole and the wheel hub which will exist inside it. It's nice if you do drill the 3 holes for the studs that hold the stator to the wind turbine before you do the welding on the frame, then you can clamp the stator bracket to the stator on center and drill 1/2" holes right through it. If you do it this way, it's very important that the center hole of the stator be just about perfectly centered with the stator bracket. Also be sure to have the 3 holes come out between coils - preferably with the 3 wires coming out between the same two holes. You don't want to hit copper with the drill bit! If you've allready welded up the frame then you can center the stator on the wind turbine frame against the stator bracket and clamp it there - and drill through the holes. Drill 3 holes 1/4" in diameter about 1/2" away from the edge of the stator - one near each of the leads that's coming out. Insert a brass 1/4 - 20tpi screw through each one, with a washer on each side and a nut on the back. Cut the leads just long enough so you can clamp each one between a screw head and the washer. You can put a couple more washers and one nut on each screw now. These will serve as the lugs to which we can connect the line to the wind turbine. 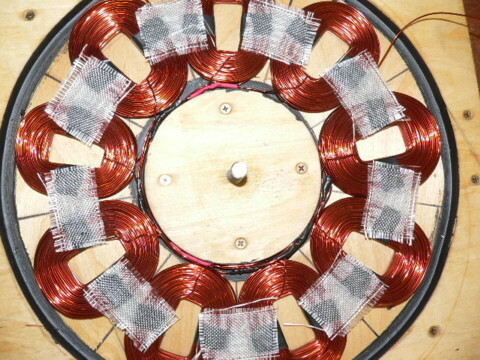 The stator is finished! We can put that aside untill we're ready to assemble the alternator. Click Here to return to the front page of this project.